I am not Perez Hilton, but I want you to know and I share with all you that I was so excited to be part of this experience, but became a nightmare for me and my friends. I was not sure what to expected, so I email in private emails, social media like Facebook, LinkedIn the I was going to the THE X FACTOR™ HOLLYWOOD WORLD PREMIERE on 9/14! to to join, Simon Cowell, Paula Abdul, LA Reid and Nicole Scherzinger. Let me tell you the we waiting outside the ArcLight Cinerama Dome located at 6360 W. Sunset Blvd in Hollywood, CA on the line for 3 hours. Dress code: DRESS TO IMPRESS!!! **AS THIS IS AN EXCLUSIVE PRIORITY PASS TICKET, YOU (& YOUR GUESTS) MUST ARRIVE NO LATER THAN 30 MINUTES BEFORE THE DOORS OPEN FOR GUARANTEED ENTRANCE. 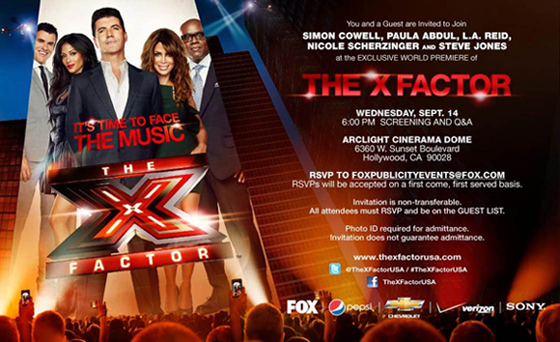 PLEASE ENSURE YOU REPORT TO THE APPLAUSE STORE MANAGER UPON ARRIVAL.You are now officially invited to join SIMON COWELL, PAULA ABDUL, L.A. REID, NICOLE SCHERZINGER and STEVE JONES at theEXCLUSIVE WORLD PREMIER of THE X FACTOR in HOLLYWOOD!Have you got what it takes to go interact directly with THE X FACTOR judges? Have you always wanted to ask Simon, Paula, Nicole, L.A. and Steve Jones a cheeky question? Well now you can also be part of the live Q&A! How amazing is that!!! Upon your arrival, you join the entire X Factor team at the Hollywood World Exclusive Premiere red carpet, meet all the judges and then get a front row seat to see the first episode of THE X FACTOR before it premiers on FOX on September 21st! This is a once-in-a-lifetime chance to get a first glimpse of Simon Cowell’s new show that is searching for the next great superstar or group who are all competing for the biggest prize in television history; a $5 million Sony Music recording deal and an appearance in Pepsi’s 2012 Superbowl spot. I can tell you the after we (me and my friends) were admitted we were routed to the red carpet, where the venue? or FOX or Applause Store USA staff security would want to keep us there. The reason they wanted media/press outlets to report and show the hundreds of people were there for the premiere but the is just acting. Any how I was in there for about 2 hours, I wanted to go to bathroom and this STUPID security wanted me to go out, I told him there is no bathroom there and he say you must be outside of the Theater. I told him I really need to use the restroom. Finally I was routed and when I was close to Theater this person told me the with the pass I have I would not have access to heard SIMON COWELL, PAULA ABDUL, L.A. REID, NICOLE SCHERZINGER and STEVE JONES speaking. I told my friends to live the place, but some of them stayed and didn’t care be treated like second class citizens. Any how when I was leaving I approached the main publicist, event I gave her my business card. Let me tell you the I tried first to go as regular fan of the show, but I saw couple non reputable media/press outlets representatives crashing on the event and they got ALL ACCESS CREDENTIALS. So when leaving I told them who I was and was refer to the person in charge. A Chinese women which I introduced my self and even gave her my media/press representation business card. Yes I represent Diversity News Magazine, Examiner.com and Yahoo.com Any how she told me to wait. I waited more, shen she left and I saw she even left my business card on the table. This women needs some ethical and professional training. I finally gave up and yes at the end of the day, I learned my lesson the because of this I will not watch The X Factor USA, but I will give FOX Networks, FOX TV a second chance. Contact me at: editor@diversitynewsmagazine.com or call me at (213)321-9408. WHAT DO YOU THINK OF THIS MY FANS? PLEASE LEAVE ME YOUR COMMENTS, QUESTIONS. THANK YOU.